A new TILDA report published on 18th July shows that nearly four out of five adults over the age of 50 are overweight or obese and a similar proportion has an ‘increased’ or ‘substantially increased’ waist circumference. This means that just one fifth of the over 50s have a normal BMI or waist circumference. 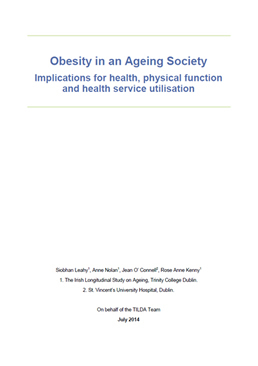 The report, titled 'Obesity in an Ageing Society', highlights the increased health risks and health services burden in older adults due to high rates of obesity.